I’m so starstruck, baby, ’cause you blow my heart up. Actually, Light Up the Stage is capable of blowing up quite a lot of things. The main issue is that it can be a little awkward trying to do so when it costs three mana: you still have to pay the mana costs for the exiled spells, so missing out on its spectacle cost can mean waiting until control and midrange decks are already stabilizing. 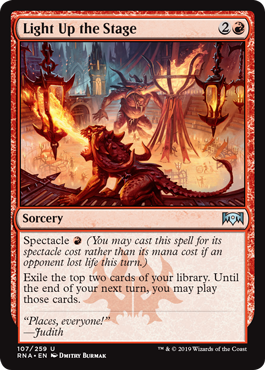 Triggering spectacle is usually not too difficult in red and Rakdos decks full of aggressive creatures and damage spells, especially in faster environments – there’s a reason this card is being looked at for Modern. When it hits at the right time, it can be downright impossible for an opponent to make a comeback. Red is notorious for its mediocre card advantage, so Light Up the Stage is a very exciting card for decks that had a clear weaknesses. While red is poor at drawing cards, red is not poor at punching opponents in the face, so this shores up a bit of a red weakness in the form of their “impulse drawing”. And unlike some of its “impulse” drawing, this gives you two turns to use the cards exiled by Light Up the Stage. So even if you exile a pair of lands, you have a use for them, playing one that turn and one the turn after it. One useful point is that, even if you’re struggling to get opponents sufficiently punched in the face, the non-spectacle cost is wholly affordable; Divination is a bit inefficient, but has always been at least playable enough…especially in a color that might kill for a Divination. The upshot is that one red mana is an even better rate of return for this effect, and it asks red to do a thing it likes to do. This might be one of the more quietly-exciting cards of Ravnica Allegiance, with a clear deck that wants it and a niche that allows it to shine.